Reduce takeoff time by 80% – bid more work . . . and get more work! Increase accuracy – quit losing money to errors and omissions and restore profits! Graphic audit trail verifies your estimate. *You will receive a $400.00 rebate, if you purchase the Ziatek® RoofMaster Advanced Graphical Roofing Takeoff Software along with any GTCO Roll-Up III or Super L VI Digitizer. For more information, please contact us at 888 246-9613. 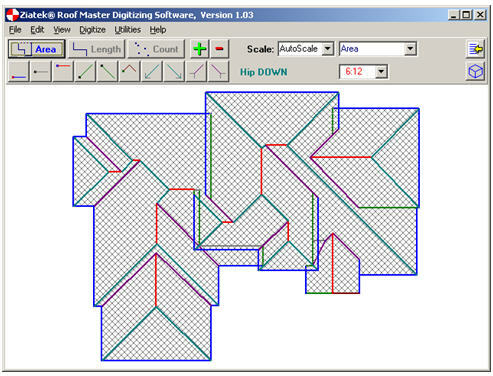 Ziatek® RoofMaster will enable all those faced with the task of calculating material quantities on any type of roof - residential, commercial/industrial, flat, pitched, gable, hip, etc., etc. When it is used along with a GTCO Calcomp Super L® or Roll-Up® digitizer, critical quantities are obtained accurately and quickly. An onscreen color-coded graphic image verifies the takeoff, and the calculations are easily placed into any WindowsT program that is used for pricing the job. Keep separate lengths for each 'Edge' type. Compute Pitched and Plan Areas. Roof areas can be digitized from Plan View or Elevation. Print takeoff screens in Color and/or in Black and White. Send takeoff quantities DIRECTLY to Excel, Lotus or other Windows programs without cumbersome Cut/Copy/Paste operations! The easy-to-use Menu Pad is active in RoofMaster and in most estimating applications allowing the user to navigate in other programs with the digitizer pen, reducing the need to switch to mouse and keyboard for program operation. View in 3D from any angle to understand complex installations. Optionally display the area of each facet and length of each edge type. Applicable to all types of roof materials, i.e., composition, built-up, clay tile, shake, etc..
Full 3D geometry is actually stored in DXF files that can then be imported by your favorite DXF compatible CAD program. Onscreen graphic image showing the areas you have completed will ensure that nothing is missed. Switch from 'Plan View' to '3D Perspective View' with a single mouse click. Intuitive nature, often requiring less than 30 minutes of training to be used efficiently. IBM PC or compatible computer running Windows™ 2000®, 2003®, XP®, Vista®, 7® or 8®. Intel™ 2.0 GHz Pentium® 4 or better with at least 512Mb of available memory. A Windows™ program, e.g. Microsoft Excel®, Master Builder®, Timberline®, American Contractor®, etc.